Teaching teenagers is a calling. Despite limited social respect and wages that sometimes border on mere subsistence, dedicated professionals heed the call. The job is not easy. Teachers must deal with ignorant administrators and hormone-fueled adolescents on a daily basis. It's not a job for the faint of heart. Actress, poet, writer, and artist Liza Jessie Peterson heard the call. But her calling was to teach in what could be considered one of the most challenging educational environments imaginable: the infamous Rikers Island jail in New York City. 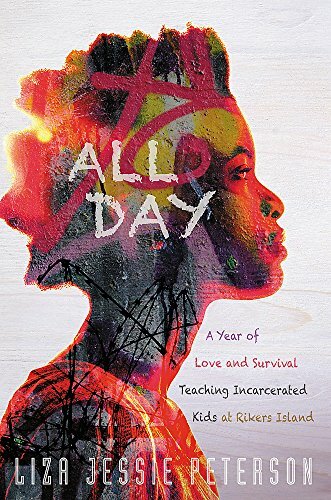 Peterson's book, All Day: A Year of Love and Survival Teaching Incarcerated Kids at Rikers Island, is a powerful memoir of the experience, one that provides a rare and poignant insider's view of the intersection of education and juvenile justice. Rikers Island is not a pretty place. Built on a closed landfill and in the flight path of a major airport, the jail is "its own altered reality, a sub-universe, an ugly island surrounded by dookey-brown stinky water," that smells of rotten eggs. The 415-acre island houses approximately 12,300 inmates. About 800 of the prisoners held at Rikers are juveniles. Because of their status, the state is required to educate them. Whether pre-trial, sentenced and awaiting transfer upstate, or doing county time, these young prisoners can attend high school classes provided by the Department of Education while locked up at Rikers. Peterson stepped into this volatile world. Her experiences included witnessing fights between the young prisoners and fights between the kids and the guards. On a daily basis, she met and surmounted the challenges of maintaining discipline and order in a chaotic place. And she taught. Despite the horrendous environment, the indifferent administrators and guards, and the legitimately distracted student prisoners, she taught. Peterson demanded respect and hard work from her classes, she gave love and imparted wisdom, and every student was better for it. But Peterson's journey was just that: a passage from inexperienced newbie to master teacher. The problems that her students faced were myriad and went beyond whatever criminal charges they faced. Unaddressed emotional and behavioral problems abound in the environment of juvenile justice, as does untreated mental illness, and all too often, unresolved and sometimes ongoing childhood trauma. Peterson had to learn how to navigate this minefield of student issues while ensuring that her young charges received an education. Peterson's experiences as a teacher of incarcerated youth highlight one of the shortcomings of the American juvenile justice system. We know that developmental issues in the brain are responsible for much of the risky, emotionally charged behavior of adolescents. The all important prefrontal cortex is not fully developed, and juvenile crime can in some cases be directly linked to the immature brain. The criminal justice system has been very slow to accept the reality of juvenile crime, however. As such, Peterson found herself teaching students who may have been incarcerated for actions that were beyond their control. But Peterson put her boots on the ground and went to work. An activist at heart, she hopes for changes to the entrenched racism that leads to the incarceration of so many black youths. In the meantime, though, she put in the work. "Preventing our kids from going to jail is paramount," writes Peterson, "but getting them out and helping them to stay out requires reaching them while they are in custody, feeding them empowering information and then providing a network of support upon their release." The experiences of Liza Jessie Peterson, a righteous warrior in the battle for equality and justice, are equal parts eye opening and inspiring. It is a national disgrace that we incarcerate so many black teenagers, but it is a point of national pride to know that there are heroes among us, such as Liza Jessie Peterson, who will answer the call to speak truth to power.